Table Top Displays are a great way to advertise your products or services at tradeshows or events without breaking the bank. 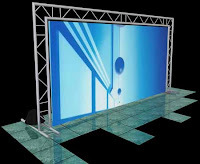 Why not use truss to create your table top display? It's cheaper than you think. Just a few little pieces of truss that can be put together in a few minutes and hang a graphic panel up with our exclusive Milos plastic clamps and a couple of lights and you have yourself a very high end table top display that's inexpensive. Call us today at 888-804-0042 or email us at Sales@DisplaysExhibits.com today to discuss options!